GOP candidate and front-runner Donald Trump has spewed out nothing but hate ever since he took the stage in the American presidential race. Trump’s personal background as a real estate giant and his controversial opinions about every sensitive topic possible have earned him the spotlight in mass media as well as in everyday conversation. I think what’s going on is that we have a fascist at our hands. When most of us think fascism, the primary example that comes to mind is Nazi Germany — and that is not a good memory. Another example, although maybe a little less commonly known, is that of Italy under Benito Mussolini. Adolf Hitler and Mussolini’s time as leaders of their respective countries during World War II was terrifying, to say the least. But once both these atrocious regimes had been defeated by the end of the war, all of humanity took a step back and reevaluated what had happened. How had the world let somebody get away with this level of hatred and mass murder? The world promised each other never again. Never again will we silently watch genocide unravel itself. Never again will we let hate for a single group reach the extent it did under the fascist regimes of Hitler and Mussolini. Never again will we let the love for one’s own country evolve into hatred for others. We united in denouncing fascism as a political ideology that was vile, hateful and completely ill fitting for our world. Yet today, we have a leader, potentially the future leader of the world’s most powerful state, who is openly advocating for fascist policies. Donald Trump has declared himself as the leader who can “Make America Great Again,” asserting that he can revive the “American Dream.” Both Hitler and Mussolini held similar views about themselves. In fact, Mussolini framed himself as Il Duce, literally translating to “the leader” who would return glory to Italy. Trump has suggested that Muslim-Americans should carry special IDs in order to be easily identifiable at all times. I don’t see the difference between this and the yellow star with the label “Jude” that Jews in Germany were forced to wear under Hitler’s regime. Trump’s discriminatory political ideas and words are not exclusive to Muslims, however. He has blamed Mexican immigrants for stealing jobs and called them rapists, applauded his supporters for violently removing a “Black lives Matter” protestor from one of his rallies, planned to deport millions of immigrants, mocked disabled people and he has spread false propaganda against African-Americans and Muslims. And now, Trump has gone to new limits by suggesting that a whole segment of the American population should be removed from society. Scapegoating entire segments of the population for economic problems, rejecting and insulting visible minorities for the purpose of dividing the population and instilling fear are all strategies that we have seen being used by fascists in the past. This isn’t new. For the sake of interest, I also find it necessary to mention, according to a Vanity Fair interview from 1990, Trump’s wife, Ivana Trump (now ex-wife), told her lawyer that Trump kept a book of Hitler’s speeches by his bed. The warning signs are blatantly clear. All our red flags should be going up. And thankfully, for a lot of people, they have. Linda Sarsour, a Muslim-American civil rights activist, has said we are “cheering an American fascist.” Numerous other national figures, including politicians, have repeatedly called Trump out on his fascist rhetoric. But frankly, Donald Trump’s fascism is less concerning than the support his fascism is receiving. According to numerous polls, including this Huffington Post poll on the 2016 National Republican Primary, Trump is currently the most favored GOP candidate. 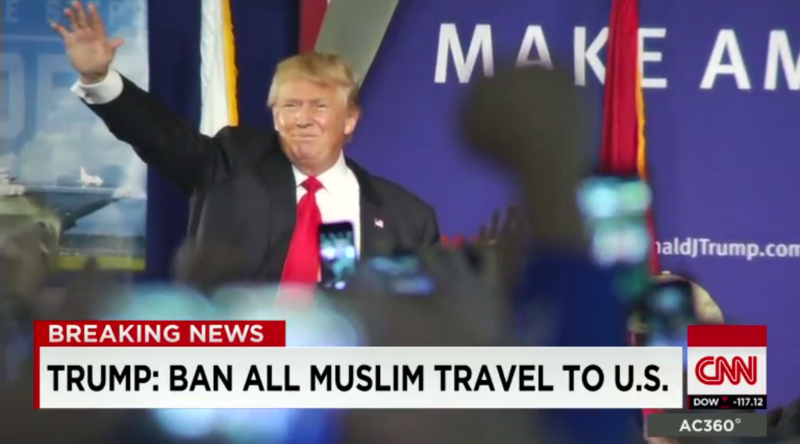 After Trump declared this week that Muslims should be banned from entering the U.S., CNN asked supporters lined up outside one of his rallies if they agreed with him or not. Donald Trump has just become the loud, unapologetic voice for American bigots and racists who were thus far too afraid to openly express their views to the public, expecting backlash. Casually hating immigrants, refugees, Muslims, black people and other visible minorities has become a norm. An ugly, terrifying monster has been let out of the closet and it’s going to be incredibly difficult to undo the damage. Psychologists, sociologists and people from all walks of life have wondered after World War II how average citizens could have supported someone like Hitler or Mussolini. Everybody was dumbfounded. It seemed impossible that the average man and woman would back fascist policies like the ones introduced in Europe at the time. But we must be aware that the narratives being fed in America are not funny. Donald Trump is not a joke and this is definitely not a phase. If we, as a society, continue walking on the path we’re on right now, we could walk straight into dark parts of our collective history that we promised to leave behind. Trump represents traditional American bigotry…….